Elephants For Eagles, Puppies For Patriots: Animals Predict Super Bowl LII The New England Patriots face off against the Philadelphia Eagles in Super Bowl LII on Sunday. Who will win? These animals make their highly educated guesses. All eyes will be on the New England Patriots and Philadelphia Eagles this Sunday as the teams face off in Super Bowl LII. Who will win the coveted Vince Lombardi Trophy this year, the perennial favorite or the underdog? You can spend hours analyzing statistics, or you could trust the intuition of animals that don't understand football. As a reference, the Westgate Las Vegas SuperBook had the Patriots as 4-point favorites on Friday. At the Myrtle Beach Safari in South Carolina, Bubbles, a 9,000-pound African elephant, flipped over the Eagles helmet with her trunk and devoured the apple underneath. Cincinnati Zoo's celebrity hippopotamus, Fiona, ate her greens out of the Eagles box. Underdogs have to stick together, after all. 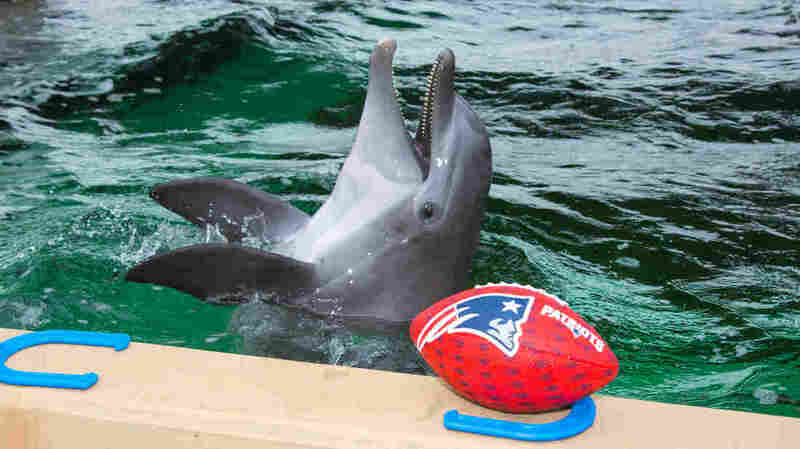 Nicholas the rescued dolphin at Clearwater Marine Aquarium chose the New England Patriots on Jan. 29, 2018 to win Super Bowl LII. When given the choice between a Patriots and Eagles football, Nicholas the rescued dolphin at Clearwater Marine Aquarium in Florida guided the Patriots football toward the "dolphin football judge." This psychic dolphin is six for seven in sports predictions, including a correct selection last year for the reigning Super Bowl champions Patriots. The Eagles have reason to fear. Phoenix Zoo's sloth, Fernando, made a decisive pick in favor of the Eagles by slowly climbing toward Philadelphia's container. It's always a delight watching sloths eat flowers, but this video set to a sultry soundtrack is a true gem. The Patriots are going to get its third Super Bowl title in four years, according to April, Animal Adventure Park's celebrity giraffe. April gained worldwide fame in 2017 when the late stages of her pregnancy and eventual delivery were streamed live on YouTube. Le Le, a giant panda at the Memphis Zoo, declared Philadelphia to be the Super Bowl LII champions by pulling down the Eagles banner first. At just 1-3 in Super Bowl predictions, though, Le Le is more cute than accurate. In the 2018 installment of this fan-favorite segment, more of Jimmy Fallon's 11-panel of puppies ate from the Patriots bowl than the Eagles bowl. The real MVP, though, is the puppy that refused to participate at 1:39. Ahren the eagle, a resident of Myrtle Beach Safari in South Carolina, swooped down from a perch and looked briefly at the stuffed bear donning Patriots gear before picking her stuffed counterpart. Of course, this surprised no one. Even Ahren's handler admitted: "She might be a bit biased." Linda Wang is an intern on the National Desk.